A Short History of the Griffon Bruxellois. There is only one certain thing when it comes to the history of the breed and that is that there are many different versions of just how this outstanding dog came into being. There have been claims that it was originally a British breed with crosses of the Yorkshire Terrier and the Irish Terrier as its beginning. It is very apparent that the short face did not come from either of these breeds. It is however a fact that no matter what the breeds that make up the Griffon, it had its beginning in Belgium. There had been a little street dog around Brussels for many years and these were used in the stables to keep down the rodent population and to ride on the hansom cabs. These dogs had longer noses than our present Griffon and were of various colours - some of which we are still trying to eliminate from the breed. And there was great discussion among prominent early breeders as to whether the dog should be short-faced or have a more Affenpinscher-like nose length. And by the way the Affenpinscher was not an ancestor of the Griffon but the Griffon was introduced into that breed to give it a more solid body. In 1880, the 15th anniversary of Belgium independence, a show was held as one of the celebrations. About 976 dogs were exhibited and among them was a class for ‘stable and apartment dogs’ and a class was included for ‘short-haired terriers’. This group consisted of various small dogs including five ‘small long-haired Terriers under 3 kilograms’. Dogs exhibited in various shows after this were generally red, and rough-coated. It is in the fifth volume of LOSH (Belgian stud book) that the name Griffon Bruxellois – little red-haired Griffon - is first used. And in the magazine ‘Chasse et Peche’ of May 1886 Louis Vander Snickt published the first draft Standard of the breed based on the winning dogs of the time. There was then no quarantine for dogs arriving in England and many winning dogs were purchased and taken back. The Griffon was becoming a very popular little dog. Various crosses were made to ‘enhance’ the look of the dog and we know for sure that the black pug and the Ruby King Charles Spaniel were included. The Pug introduced the short coat and the King Charles the rounded head and large eyes, and also it is believed, the web foot that sometimes occurs. Other colours often turned up and eventually the black, black and tan and the red with black mix were registered as Griffons Belge. And the short coated-dogs became Petit Brabancons. As these coat-types and colours were registered at different times to the original red Griffon Bruxellois they have separate sections in LOSH and are shown and judged as different breeds. The U.K., Australia and the U.S.A. now judge them all as one breed. The Griffon reached Australia in the 1930’s and even though it languished for a time, there were more imports from the U.K. And in 1975 the Griffon Bruxellois Club of Victoria was formed. N.B. 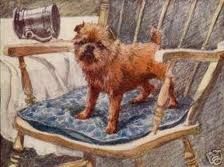 All quotations are from the book History of the Griffon Bruxellois, Griffon Belge and Petit Brabancon. By Jean-Marie Vanbutsele.